The assassination of Mr. Fuqaha could herald a new kind of shadow war between bitter foes — a message from Israel to Hamas’s new, hard-line leader, Yehya Sinwar. Or Mr. Fuqaha’s death could be an ominous sign of internecine rivalries among Palestinian factions and even within Hamas under Mr. Sinwar, who carries a reputation as a harsh enforcer of loyalty in the group. Mr. Fuqaha and Mr. Sinwar shared a cell for a year in an Israeli prison, Mr. Fuqaha’s widow, Nahed Assida, said in an interview on Monday. “They were close friends,” Ms. Assida said. The assassin, or assassins, who killed Mr. Fuqaha shot him point-blank using a weapon fitted with a silencer, according to Hazem Kassem, a Hamas spokesman. This, he said, was one of several “Mossad fingerprints” pointing to Israel as the perpetrator. Israel has carried out assassinations of Hamas leaders in Gaza in the past, usually by airstrikes. Hamas has typically responded by firing rockets into Israel. Hamas officials said that only Israel had anything to gain from the assassination, and that they would choose the right time and place to take revenge. Israel has not confirmed or denied involvement, preferring to maintain ambiguity. Some former Israeli officials and experts have suggested that Hamas’s rival, the West Bank-based Palestinian Authority, or Egypt could also have had an interest in Mr. Fuqaha’s demise — or even Hamas itself. “Hamas is accusing us, but it could be Hamas,” Danny Yatom, a former Mossad chief, told Israel Radio. If Israel was behind the killing, he said, “it is possible we are witness to a preventive strike and not an elimination,” suggesting that Mr. Fuqaha may have been planning an attack in the West Bank or Israel. Gaza’s Interior Ministry has taken the extraordinary measure of closing border crossings with Egypt and Israel to anyone except for patients needing medical treatment, the families of prisoners in Israeli jails or ministers in the Palestinian government. 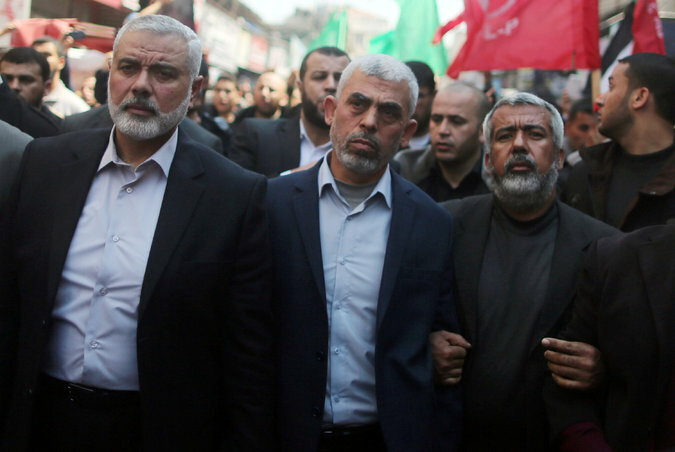 The Hamas leaders Ismail Haniyeh, left, and Yehya Sinwar, center, at Mr. Fuqaha’s funeral. Mr. Fuqaha lived in the Tel al-Hawa neighborhood in Gaza City, where members of the Qassam Brigades searched cars around the apartment building on the night of the assassination. The authorities also closed Gaza’s small port on the Mediterranean coast, barring fishermen from setting sail, as there was speculation that the assassin, or assassins, may have escaped by sea. On Monday, dozens of police motorcycles surrounded the building and barred reporters from gaining access. The Palestinian attorney general, Ismail Jaber, announced a ban on the publication of any details relating to the investigation. People in the neighborhood said Hamas security forces had searched all the apartments in the building and had taken the male residents in for questioning. Thousands participated in Mr. Fuqaha’s funeral on Saturday, which was also attended by top Hamas leaders, including Mr. Sinwar. Mr. Fuqaha, who was 38, was from Tubas in the West Bank. In a statement issued after his death, the Qassam Brigades said he was a leader with “a great role in planning and supervising a number of heroic anti-occupation operations” against Israel. He was convicted and sentenced to nine life terms in prison by Israel for his role in planning a suicide bombing that ripped through a bus in the Galilee in 2002, at the height of the second Palestinian intifada, killing six civilians and three Israeli soldiers. He was released in 2011, along with Mr. Sinwar and 1,000 Palestinian prisoners in exchange for Gilad Shalit, an Israeli soldier who was captured during a 2006 cross-border raid and was held by Hamas in Gaza for five years. Israel barred Mr. Fuqaha from returning to the Israeli-occupied West Bank, so on his release he moved to Gaza, where he joined Hamas’s remote “West Bank command.” Israel withdrew its forces and settlers from the Gaza Strip in 2005. She was sitting in a women’s mourning tent in Katiba Square in central Gaza as hundreds came to pay their respects. Dozens of children gathered around dressed in Qassam outfits and carrying toy guns. On the day her husband was killed, Ms. Assida said, they had taken their 4-year-old son, Mohammed, and 18-month-old daughter, Sama, to the beach. After they returned home, Ms. Assida was getting the children ready for bed in their fifth-floor apartment. She said she had not worried when Mr. Fuqaha did not immediately come home after going to park his car. She assumed that he was talking to neighbors. Ms. Assida said that Israeli soldiers would break into her family’s home in the northern West Bank city of Nablus, threatening to kill her husband if he did not stop his activities.